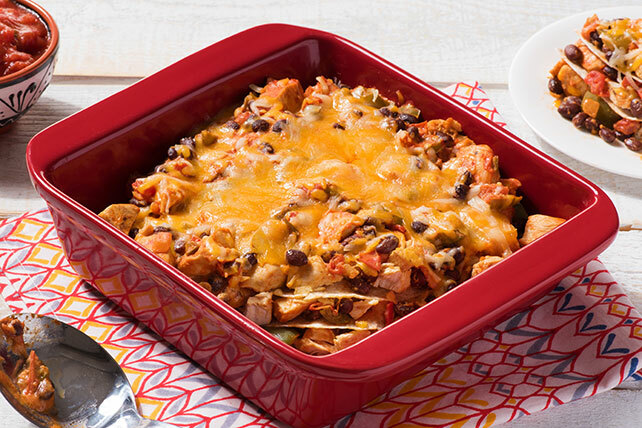 Bring together veggies, black beans, whole wheat tortillas & cheese in this Mexican Chicken Casserole. Serve this Mexican Chicken Casserole on a weeknight! Cook and stir chicken and cumin in nonstick skillet on medium heat 2 min. Add peppers; cook 2 min., stirring occasionally. Stir in salsa; cook 2 min. Add Neufchatel; cook and stir 2 min. or until melted. Stir in beans and tomatoes. Spread 1/3 of the chicken mixture onto bottom of 8-inch square baking dish sprayed with cooking spray; cover with 1 tortilla and half each of the remaining chicken mixture and shredded cheese. Top with remaining tortilla and chicken mixture; cover. Bake 20 min. or until heated through. Sprinkle with remaining shredded cheese; bake, uncovered, 5 min. or until melted. Garnish with 1/4 cup chopped fresh cilantro just before serving. Serve with a crisp mixed green salad to round out the meal.